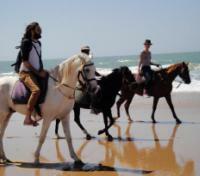 Choose to horseback ride on the beaches of Essaouira. 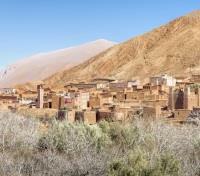 Head into the High Atlas Mountains with private guide. Step into scenes from Gladiator at the Tizi n'Tichka mountain pass. 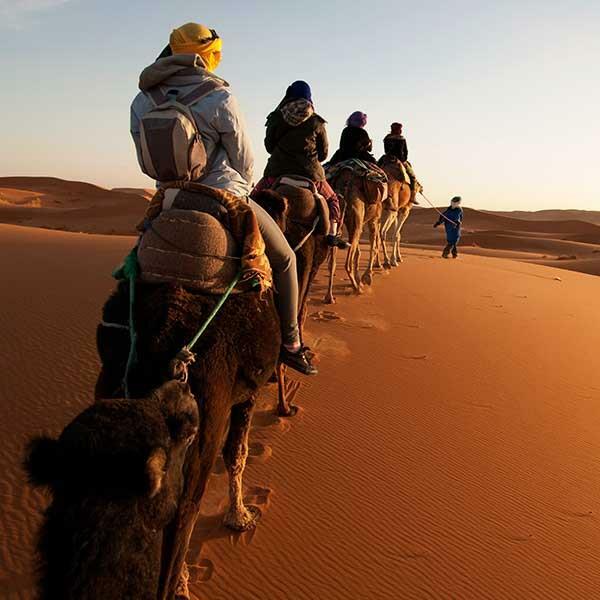 Travel through time to a mythical land of ancient caravan routes, mystical snake charmers and royal cities on this sumptuous journey through Morocco’s best towns and landscapes. 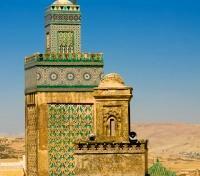 This is the ultimate tour of Morocco. 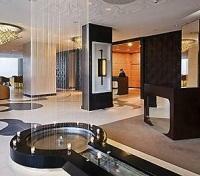 You will be privately transferred between Casablanca and Rabat by a professional driver and an English-speaking guide. Approximate travel time is one hour and 30 minutes. 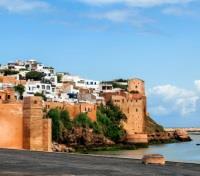 Ever since the 12th century, Rabat has played an important role in the history of Morocco. Beginning in 1146, the city was transformed into a massive fortress and utilized as a port to launch attacks on neighboring regions. 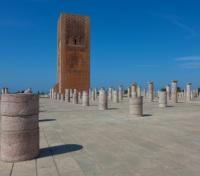 The Medina of Rabat, host to the Hassan Tower, is listed as a UNESCO World Heritage Site and is also the site of the ruins of an unfinished mosque that – as originally planned – would have been the largest in the world. Through the centuries, Rabat served as one of the many ports in North Africa for Barbary pirates, and they were particularly active in the port from the 16th through the 18th centuries; the history of their presence is fascinating and resonates to this day. Besides its interesting history, Rabat is also an excellent city for shopping with a number of curios, craft-shops and marketplaces throughout the city. 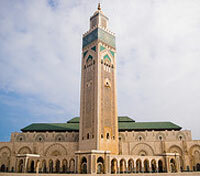 With your private driver and English-speaking guide catering to your needs and interests, your city tour of Rabat is sure to be fun, informative and engaging. 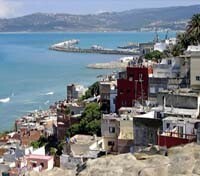 Travel today between Rabat and Tangier in a private vehicle with an English speaking driver and guide. Situated on the Straits of Gibraltar, where Europe and Africa almost touch, El Minzah is a haven of peace and tranquility. During your stay you can relax in the luxuriant gardens, nestled within beds of roses and giant geraniums, lilies, hibiscus and countless exotic plants. The immaculate lawns are shaded by palm, orange and eucalyptus trees. The hotel’s charming rooms are furnished with polished woods and brass, with ornaments and pictures setting off the grandeur of the hotel. Enjoy dinner outdoors in the courtyard or in one of the other restaurants or bars; sit back and enjoy great food, ambiance, and live entertainment. Built in a Spanish Moorish style, El Minzah boasts stunning views over the Bay of Tangier, the Straits of Gibraltar and the Rif Mountains. 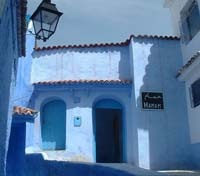 Travel today between Tangier and Chefchaouen by private vehicle and english speaking driver and guide. The beautiful city of Chefchaouen is located on the rift of the mountainous region between the Mediterranean Sea and the Iberian Peninsula. Known for its shady alleys, whitewashed and blue turquoise homes, wrought iron windows, colorful tile roofs, and fascinating souks, the best way to discover this holy town is to wander at leisure with your private guide. You’ll discover a powerful charm in Outa-el-Hammam Square, a cobblestone medina at the foothills of a rugged mountain that is popular among locals, and - while sitting on the terrace of a café taking in the view of the grand Tarik-Ben-Ziad Mosque whose octagonal minaret is inspired by the Torre de Oro in Seville - you’ll sure to spot Spanish influence. 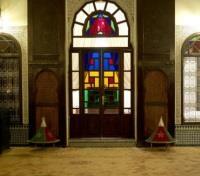 Housed inside the walls of the mosque is a small but impressive ethnographic museum featuring collections of embroideries and colored pieces of clothing worn by the region's women including the famous djellaba – a long garment worn by the men and women of North Africa – which was first fashioned in Chefchaouen. For something different, visit a traditional oil mill – the region is host to more than 1,500 of them – or a craftsman's workshop. Over and above exceptional weaving, Chefchaouen is renowned for its basket-making and its pottery as well. For the more active, Cascades d’Akchour is a remarkably beautiful hiking trail just outside the city. 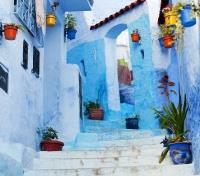 Simply speak with your guide to craft the ideal day in Chefchaouen and then set out to explore. 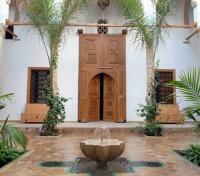 Riad Dar Echchaouen is situated in front of the Medina of Chefchaouen, in the Mountain & near of the River “Ras El Ma”. Riad Dar Echchaouen is a beautiful guest house which is the ideal place to relax and to discover the city of Chefchaouen. 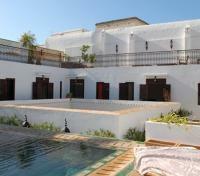 The house offers 12 rooms and suites decorated with the pure local tradition. 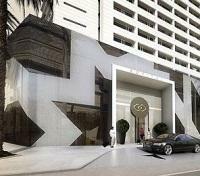 Each one of the suites is equipped with a chimney, private bath room, air condition, and heating. 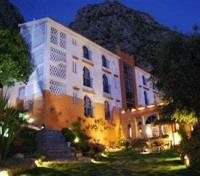 The hotel has a terrace with a splendid view over the old Medina of Chefchaouen, the Mountains & the river of “Ras El Ma”. 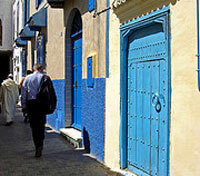 A private vehicle with English speaking driver will provide a transfer between Chefchaouen and Fes. 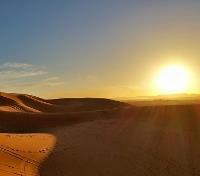 During the transfer, enjoy some brief touring stops including a visit to Meknes, the famed Ismailia capital known for its 40 km long walls and numerous gates. 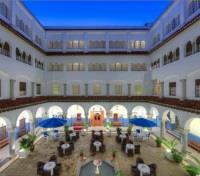 Next, visit Bab Mansour, the Royal stables, the amazing markets and also the popular Jewish quarter. 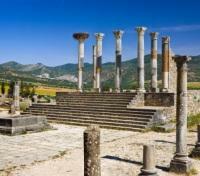 Before arriving in Fes, explore the ruins of the ancient city of Volubilis and the holy city of Moulay Idriss. Upon arrival into Fes, a hotel drop-off is provided. 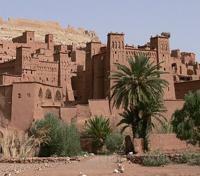 Travel today between Erfoud and Ouarzazate with private vehicle and English speaking driver. En-route, stop in the Dades Gorge, Todra Gorge's more beautiful and older sister. These gorges are located just southwest of Tinerhir and some 110 km (65 miles) from Ouarzazate. In the latter winter, the Dades River flows and in mid-spring through early summer provides a life source to the valley`s unprecedented amount of greenery. In the valleys along the Dades Gorge, you’ll notice more argan (nut) trees more than the palmeries that surround the Todra Gorge. When you arrive at the top of the gorges, you will notice the temperatures will be cooler, the views amazing, and the people delightful. Northwest of Rissani and Northeast of Ouarzazate, just up the road from Tinerhir are the Todra Gorges. Experience the unbelievable glory of the massive canyon walls reaching some 300 meters (900 feet) high and continuing for some 100 meters (300 feet). A little north-east of the southern city of Quarzazate, lays the Dadès Valley-stretching out between the peaks of the High Atlas and the Jbel Sarhro Mountain range. Known as 'The Valley of One Thousand Kasbahs', it is the most prominent of the oasis valleys that dominate southern Morocco. Originating from melt water high up in the snowfields of the Haute Atlas, the river Dadès cuts a steep gorge, known as the Dadès Gorge, at Aït Oudinar and Aït Ali. From here, it flows across the broad Dadès Valley in a south-westerly direction towards Quarzazate. 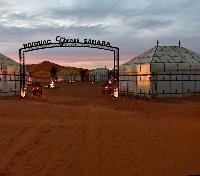 Before reaching Ouarzazate, you will make a stop in Skoura - one of Morocco’s beautiful oases. Skoura offers weary travelers a chance to rest their feet and enjoy the abundance of nature. At first glance from the road, it resembles a sort of thin, long, oasis but if you have a chance to explore within it, you will notice it is rather large and impressive. 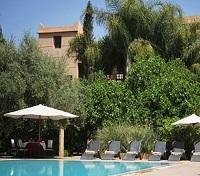 Continue to your lodging in the Ouarzazate area. On the edge of the desert at Ouarzazate where the stunning light shines on a setting of natural beauty, Hotel Riad Ksar Ighnda opens its doors for you onto the Atlas Mountains: a rendezvous for discerning lovers of luxurious sensations and relaxation. A privately driven vehicle with English speaking driver will pick you up and take you on an exploratory journey to discover some truly unique locations today. Enjoy a visit to Ait Ben Haddou, a fortified village (or ksar), ideally positioned along a once-frequented caravan route linking the Sahara with Marrakech. This quaint village is located approximately 36 miles (60 kilometers) from Skoura and has been featured in numerous Hollywood film productions for its very distinctive architecture. In 1987, this famed location was deemed a UNESCO World Heritage Site. 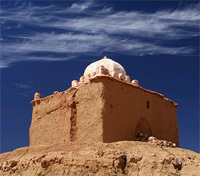 You will also visit the village of Telouet today, located approximately one hour north of Ait Ben Haddou. 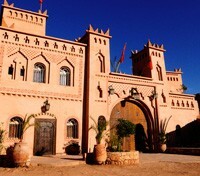 Telouet hosts one of the area's most recognized structures, the palace of the “Lord of the Atlas.” This palace was the residence of the once Vizier of Marrakech, back in the early 20th Century. An evocative relic of the time, dating back to the period when the Glaoui clan ruled over the Atlas and Marrakech, this palace acted as the family’s headquarters, situated on a broad mountain valley that affords sweeping views of the peaks on all sides. Today’s journey travels along one of Morocco’s most picturesque and dramatic roadways, the Tizi n'Tichka passage. This route travels directly through the High Atlas Mountains Range, passing beautifully-terraced valleys and adobe villages perched precipitously on the hillsides. A privately driven vehicle with English speaking driver will pick you up and take you on an exploratory journey to discover a truly unique location today. Enjoy a visit to Ait Ben Haddou, a fortified village (or ksar), ideally positioned along a once-frequented caravan route linking the Sahara with Marrakech. This quaint village is located approximately 36 miles (60 kilometers) from Skoura and has been featured in numerous Hollywood film productions, including Gladiator and Jesus of Nazareth, for its distinctive architecture. In 1987, this famed location was deemed a UNESCO World Heritage Site. 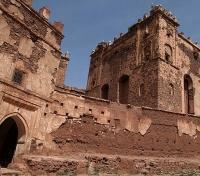 Today’s journey travels along one of Morocco’s most picturesque and dramatic roadways, the Tizi n'Tichka passage. This route travels directly through the High Atlas Mountains Range, passing beautifully-terraced valleys and adobe villages perched precipitously on the hillsides. 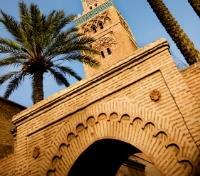 Travel in a privately driven vehicle with an English-speaking driver between Marrakech and Essaouira. The approximate travel time is two hours and 30 minutes. 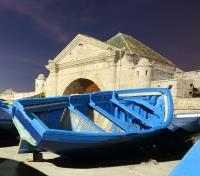 Essaouira, originally a Phoenician trading post, is one of the most picturesque towns in Morocco. With your private guide and driver leading the way, set out to discover the history of this photogenic city, learning of its initial reliance on Tyrian purple dyes for trading with the Roman empire and exploring centuries-old fortifications built by the Portuguese; there are several in the city. 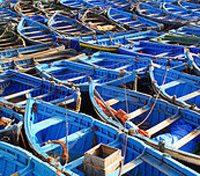 Essaouira Citadel, the city’s main fishing port, is where to find a daily supply of fresh fish as well as the best food in town. Here you’ll break for lunch looking over the Mediterranean, and later head just a few steps south to enjoy time on the tremendous beach that stretches far to the distant south. The easy-going nature of the town, the old medina and its classic blue and whitewashed buildings, the dramatic fortifications and the beach, all combine in a delightful way to create a bohemian atmosphere quite different from the rest of the country. At the edge of the ramparts, Dar L'Oussia stands as a sentry scanning the horizon. With warm hospitality, attentive and discreet service, Dar L'Oussia welcomes guests to its 24 rooms and suites decorated in traditional elegance. 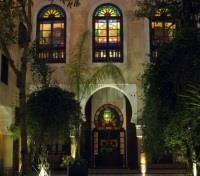 The Riad also offers a traditional hammam and a small spa with massage. 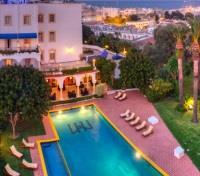 This hotel lounges in the sun offering gorgeous views of the bay, the sea, the port and the Medina. It is the perfect place to unwind in this beautiful town. 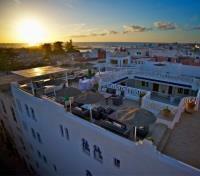 Essaouira offers a great variety of optional activities. Choose between mountain biking, hiking, horseback, fishing, sailing, surfing, wind surfing, kite surfing, camel rides, visits to vineyards, trekking, visits to Argan oil production, rural tourism. Minimum two people for hiking activity. 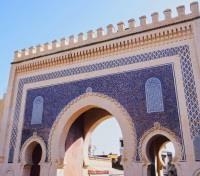 A private vehicle with English speaking driver will provide a transfer between Essaouira and Casablanca. The approximate travel time is six hours.